Put on your running shoes and conquer the world around you! Run An Empire is a territory control game for runners. Capture lands in your neighbourhood by physically running around them. Just tap “start” and begin your run. 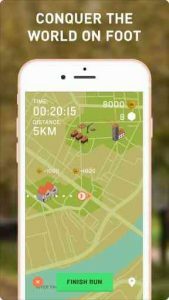 Run An Empire will track your location (from your pocket) whilst you run, whether you’re in your home town or across the world. The places you run through will become a part of your empire, earning you coins as you go. Invest your fortunes back in to your empire and bring your people into the next great era of civilisation! I know this app is new but it is a little rough around the edges currently . As an example, I am not sure if it effects all iPhones but on the iPhone XS Max lots of text, buttons, and menu items overlap each other making things unreadable. In addition to this some text at the top of the screen is obscured by the phone notch. Additionally scrolling through menus along the bottom sometimes closes the app on iPhone X and above due to the bar at the bottom of those phones. Lastly, the game is in desperate need of sound FX and music. Maybe 8bit music would be a good choice. This game has a lot of promise and I am excited to see where they take it. I ended up buying an (optional) in app purchase to help the developers out. The latest update broke GPS tracking. The app consistently tracks gps for a few minutes and then stops. This forces me to stop running at every turn in my route, open the app and wait 2-3 minutes for the app to catch back up at which point it merely plots a straight line from the last time I stopped and waited for the app to catch up. The game now really gets in the way of getting in a good run as I constantly have to mind and monitor the apps gps tracking. In app tracking was always flakey but it’s awful now. I really wish that Strava track actually worked but now tracking via the game is virtually unusable. Please fix this the game was fun before. Hey – thanks for the review. We’re working on a fix for the GPS issue – a few people have reported it. If you have any screenshot then send them to feedback@runanempire.com. We’re also expecting a fix for Strava in the next day or two. I’m not one that likes to get out of the house. Been waiting on this game for awhile, and so glad I got my hands on it. Got out of my apartment for a nice walk this evening; built up my territory a little, and fell in love with the game. Can’t wait to see what’s next.24hr update: took over a large gash of territory, is someone else is trying to take it from me. It isn’t keeps getting better and better. Really excited to see where this goes in the future. Excellent modulation to get out in the world.